The rumors continue to pour in as we get closer to its launch, which could be as early as October, so we've rounded up some highlights and potential additions that could come with this upgraded OnePlus smartphone. While we don't expect all of the features to make it, we are hopeful that OnePlus will at least hear its community and think about these for the OnePlus 7, since it's unlikely any last-minute tweaks can be made at this point. We broke down the specs into three categories: what is rumored, what is possible, and what we're hoping for. Rumored specs are those leaked by other outlets and reliable sources. Possibles are specifications that potentially could be included in the 6T but aren't rumored yet. Hopes are specs and features that, at this point, is straight up wishful thinking. Thanks to a recent leak, we believe the desire of Carl Pei, co-founder of OnePlus, might finally come to fruition. According to CNET, T-Mobile will be the exclusive US wireless carrier partner for the OnePlus 6T. This exclusivity is pending on the phone passing a certification process for the wireless carrier. If technical approval doesn't pass, the carrier launch may be delayed. With a wireless carrier, OnePlus could dramatically improve sales since most smartphones sales in America are conducted through wireless carriers. For context, 88 percent of all smartphones sales in the first quarter of 2018 were completed in physical retail stores, most of which were wireless carrier stores. They will also give OnePlus much-needed marketing, something the company has been hesitant to increase as it would hinder their ability to offer the phone at a low price. Overall, there will be two variants of the phone, one specific for T-Mobile which will be optimized for the carrier's network and the global version we've been getting for years. As for the T-Mobile version, it will include the new LTE Band 71, making it one of the better options for those in rural parts of America. AT&T customers will still be able to use OnePlus 6T using the global version which will have its bands. According to PCMag, the upcoming OnePlus 6T will have LTE Band 13. With this band, it will have all the major LTE bands supported by Verizon Wireless. And with Verizon recently supporting LTE-only phones, there is a chance it works on the US's largest wireless carrier. The problem is that Verizon Wireless has a certification process which requires phones to be approved before they're allowed on the network. If not, any software update or network updates can cause the phone not to work on Verizon. Rumors indicate OnePlus could get this certification despite their partnership with T-Mobile, as T-Mobile would still be the only carrier to sell the phone. By having three of the largest wireless carriers supporting your phone (and one selling in-store), OnePlus can really improve their brand recognition in the US and better compete against the other big OEMs. We know that OnePlus will more than likely change the name of the charging system from "Dash Charge" to "Warp Charge." A trademark application was discovered in European Union Intellectual Property Office revealing the new name, which is the result of the Dash Charge trademark being rejected by the same office due to similarity to a product from wireless audio company Bragi, as well as a service from Amazon. Although its US trademark was approved, OnePlus will likely opt for uniformity and change the system name in all marks. However, there is a chance OnePlus uses this opportunity of the rebranding to introduce a new fast-charging system, this time based on Oppo's Super VOOC technology. The current OnePlus's system is based on Oppo's VOOC, so it is likely they may adopt the new fast-charging system. Super VOOC is a supercharged version of their current system. With Super VOOC, a 3,400 mAh battery can charge from zero to 100 percent in 35 minutes. That is about double the performance of the current system and any other fast charging system offered by other companies. With Android 9.0 Pie officially releasing to Pixels and Essential phones already, there is an excellent chance OnePlus 6T will launch with the new Android version. OnePlus could even be nearly complete with porting OxygenOS onto of the latest Android version since the OnePlus 6 was one of the eleven phones running the Android Pie Beta. Expect the typical enhancements to make their way including additional customization tools and improved battery management as well. Thanks to CNET, we also learned the price and release date for the 6T. The OnePlus 6T will release about six months after the OnePlus 6 in November, which corresponds nicely with the previous T releases. The 6T's price will only increase by $20 to $550. The thing is, the with upgrades coming with this phone, I don't see how the price can only increase by $20. However, OnePlus could be anticipating additional sales from T-Mobile exclusivity, allowing them to keep the price low despite the rising cost to manufacture the new device. 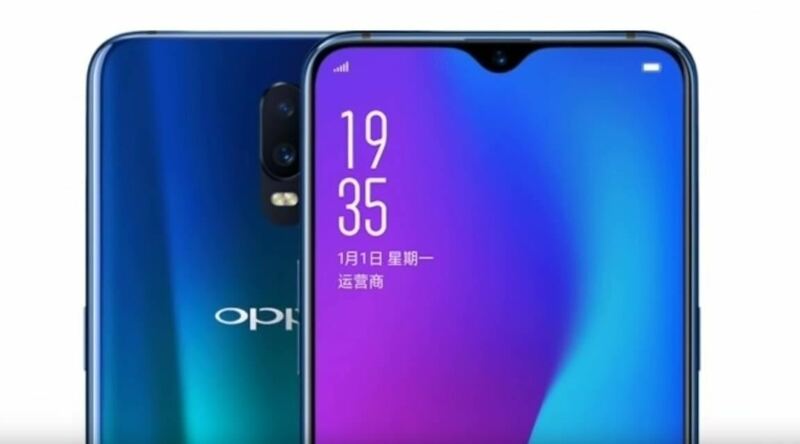 Recently, OnePlus has been borrowing Oppo's design for their devices. With Oppo, Vivo, and OnePlus all having the same parent company, BBK, this borrowing makes sense, and early rumors indicate that the OnePlus 6T will follow suit. 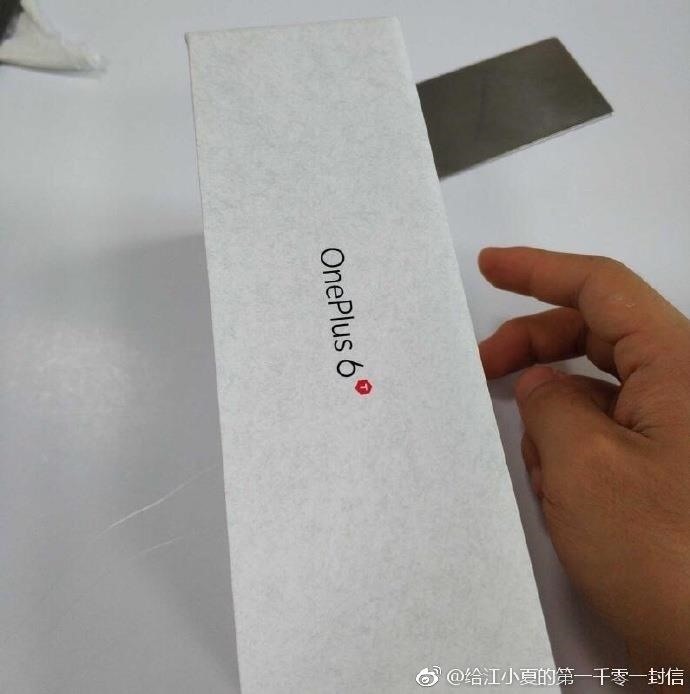 Thanks to a recent Weibo post (see below), we got our first look at the packaging for the OnePlus 6T, which revealed the new design for the front cover of the phone. And it unveiled the recycling by OnePlus of an Oppo design, with this year's phone of choice being the R17. The R17 doesn't have a physical fingerprint scanner, opting instead for an in-display fingerprint scanner. While we initially thought this technology was too new to carry over, it looks like OnePlus will bring it to the 6T. OnePlus is also once again utilizing a display notch. The 6T's notch is smaller than its predecessor, using a water drop design to reduce its size. 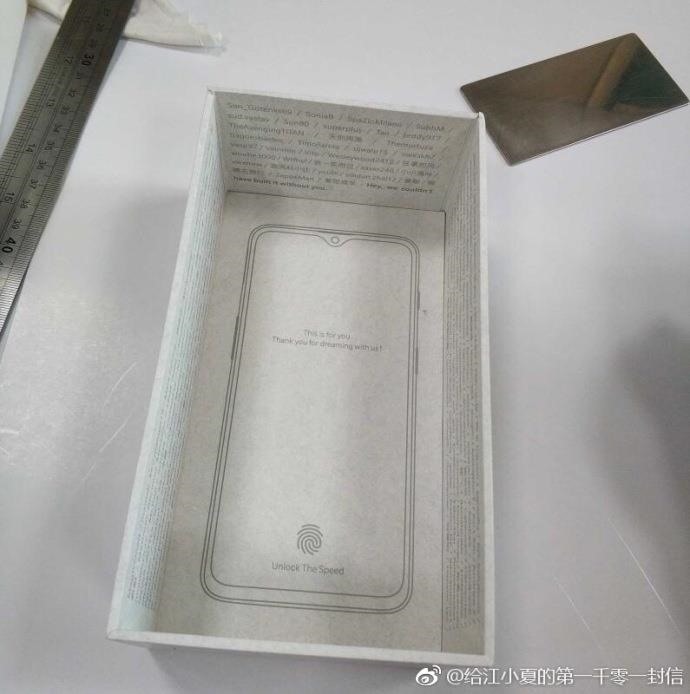 A leaked image from Weibo (see below) backs up this rumor as the complete view of the phone shows no visible fingerprint scanner. While it possible it could use a side-mounted fingerprint scanner, it appears to be that we are getting the in-display scanner. OnePlus confirmed this to CNET, stating the new feature will be called Screen Unlock. OnePlus also confirmed they had been eyeing the technology for a while, since the 5T, but only now feel it's mature enough for their standards. Due to its inclusion, the in-display fingerprint reader (which is technically embedded underneath the display) will increase the thickness by 0.012 inches. A leak arrives on Weibo showing us a complete first look at the OnePlus 6T. Based on the image, not only will the phone have the water drop notch in the front, but will have three rear cameras. The LED flash isn't seen in the image, but the assumption is that it is to the right of the camera (and therefore behind the image of the front side of the phone). The three cameras are arranged vertically along the center of the back cover. My only question about this photo is the lack of an alert slider. It is unlikely OnePlus would remove this beloved feature, but it doesn't appear to be on the phone in the photo. But if this is indeed true, it would make the OnePlus 6T one of only four phones with triple rear cameras (one of which isn't available in the US) and easily the cheapest phone. However, two recent leaks debunk the triple cameras. First, WinFuture released an image showing the new back cover of the device and its dual rear cameras. There is actually very little difference between the back cover of the OnePlus 6 and 6T, except for the rear fingerprint scanner's removal. There's also a video that appears to be an official commercial for the OnePlus 6T. In the commercial, you can clearly see the man is holding a dual rear camera smartphone and not the rumored triple. 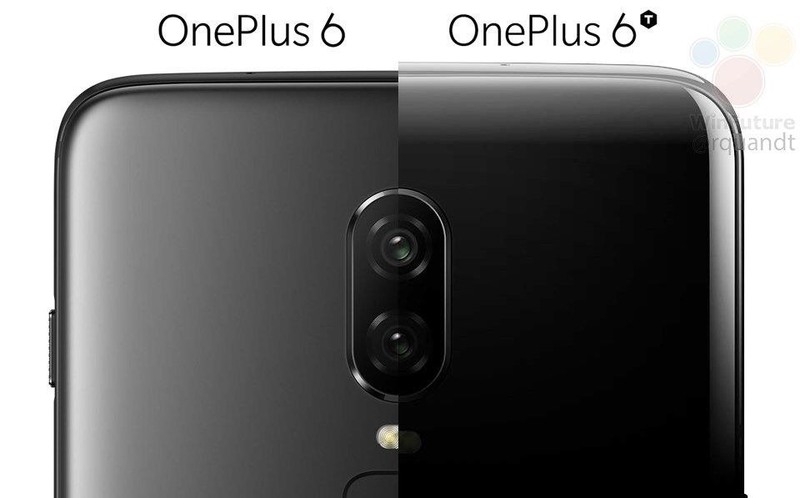 OnePlus co-founder spoke with TechRadar and revealed that the OnePlus 6T would be the first OnePlus device not to include the headphone jack. Despite teasing companies like Apple and Motorola who removed it two years ago, OnePlus will follow suit. The reason is actually very similar to Apple, better battery life. With the removal the of the 3.5 mm port, it frees up space for additional battery capacity, giving OnePlus fans even longer battery life. Additionally, as new technology emerges, they can use that space for future-proofing. To compensate for this removal, there will be dongle for your 3.5 mm headphone jack until you make the switch to wireless. Additionally, they just released a pair of Bullets earbuds which use USB-C to pair with the OnePlus 6T for the low price of $19.95. "The number of users that are taking their phone to go swimming are few and far between. To have everyone else pay, say, $30 more, for the sake of an IP rating in order to accommodate the one user who goes off and swims with their phone is unreasonable." Mr. Lau also doubles down on their reasoning for once again forgoing wireless charging. Unless wireless charging can match the speed of OnePlus's Dash Charging (or whatever they decide to call it), they will not include the technology. But for that to occur, the phone would be much thicker and conduct a lot of heat. Therefore, until the technology improves, OnePlus phones won't include it. Initial rumors indicated a launch event on Wednesday, October 17. The most substantial evidence was the lock screen released by OnePlus and used by CNET during their interview. However, it appears OnePlus was playing the old "ookey-doke" on us. OnePlus has officially announced that the launch event will take place on Pier 36 in New York City on October 30th. The event starts at 11 AM EDT. Like the 5T announcement, OnePlus will be selling tickets for the public to attend. Tickets start at $30, but for those who book before October 10th, they can take advantage of early bird pricing at $20. We guess that OnePlus will once again use the ticket revenue for a charitable donation (with the 5T, OnePlus donated to F-Droid). OnePlus is also giving out free goodies for all those who attended. Every ticket gets you a OnePlus Pin-set, a sketchbook, and Bullets Wireless earbuds ($69) for free. There will be brand new OnePlus gear at the event, snacks, and much more. And for those who can't make it to the event, OnePlus will also live stream the event. While we agree that the inclusion of an AMOLED display was a great addition to the OnePlus lineups, their refusal to add a screen with a higher resolution than 1080p is annoying. From its inception with the OnePlus One, every OnePlus device has had a 1080p display and, each year, their reasoning weakens. While we understand the omission in the previous generation due to the cost, it becomes harder to accept now with economies of scale dictating the price should be much lower now. While 1080p is fine, 1440p is better. The additional pixels makes video consumption better and makes images look crisper on your display. And with the expectation of the OnePlus 6T to include another large (over 6-inch) display, the additional pixels is needed to keep the PPI at a high enough level. While this feature is technically wishful thinking since OnePlus has not made any strides in this department, it is very much a possible inclusion thanks to the rooting community. Currently, there is a Magisk module available which turns the earpiece of the OnePlus 6 into a speaker, creating stereo speakers. Therefore, it is possible OnePlus could implement something similar to improve the quality of the speaker which, while loud, is lacking clarity thanks to its inability to separate the sound. Along the same lines, we really hope they enhance the headphone jack with a proper DAC. While OnePlus' inclusion of a headphone jack is commendable, the port inability to drive any decent pair of headphones is annoying. With only LG in the US offering a formidable DAC on their phones, this could become a smartphone of choice for audiophiles looking for great sound paired with a great operating system and skin. One of the new features of Corning Gorilla Glass 6 is the ability to add texture to the glass. Instead of feeling like glass, OEMs can now make the glass feel rougher and less slippery. This would be an excellent opportunity to bring back the Sandstone back, famously introduce in the OnePlus One. While keeping the glass back (which has signal improvement and the potential for wireless charging), OnePlus could add the rougher texture of Sandstone, making it easier for users to hold the phone. Additionally, they would also use Corning Vibrant Gorilla Glass to use high-resolution photos to alter the look of the phone. For example, they could make the phone's back color look like Sandstone. Many OnePlus fans love this look and would allow them to enjoy the make the most of new glass while meeting the wants of their customers. The OnePlus 6T could be a huge upgrade for OnePlus. Since OnePlus is a company of the people, it is only right that they eventually add these features, and there is no better time than with the 6T. We'll keep you updated as we find out more. With official T-Mobile carrier support, OnePlus 6T should enter the hands of millions of new US customers. How many customers largely depend on what changes they make. While it still early, we know quite a lot about the upcoming phone and the possible specs and hardware would make this a worthy upgrade. 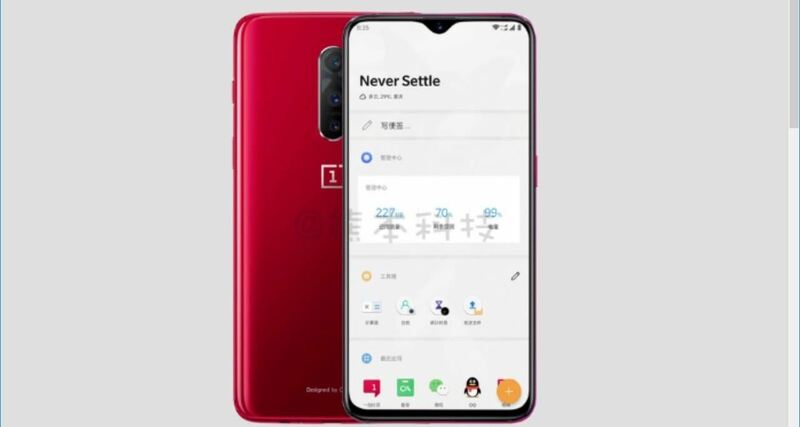 However, it's with the wishful-thinking features that OnePlus could really make an impact in America and improve the deteriorating relationship between Chinese companies and the US.